Choosing a professional to install, service and repair your refrigerated heat pump hot water system in the Cairns area can get your anxiety going at the best of times. Its time to rest easy! Your local experienced team of plumbers and gas fitters at Plumbnorth are here to help with any situation which may arise, keeping your property functional, and your family safe. ​If you require an Heat pump hot water system installation, repair, servicing or replacement at your commercial business or home residence, think your local team of experts at Plumbnorth first. You won't be disappointed with our service and attention to detail! ​A heat pump hot water system consists of a source, the heat pump itself and a heat distribution and storage system, the refrigerant is the main contributor in the heat transfer. the evaporative coil forcing the cold refrigerant in liquid state to boil off as it travels through to a warm low pressure gas as it comes out the other side. The next part of the process the low pressure gas is compressed thus creating a superheated high pressure gas which travels through the system to the condensor. 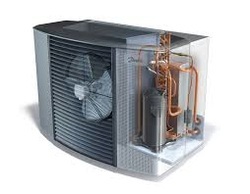 ​The condensor coil in the heat pump generally enters at the top of the tank creating a high temperature heat transfer with the outlet/leaving water and refrigerant gradually cools and transforms back to liquid state as it travels lower in the tank and back to the evaporator to start the process over again. For any repairs, servicing and installations of your business or private residence refrigerant and heat pump hot water, please consider your local team of heat pump hot water experts at Plumbnorth for the best advice and service from start to finish.